Funny how sometimes life jumps up and grabs you when you are hitting a stride. I have missed two classes, one due to family obligation and one due to my son bringing home a bug I did not want to spread around. The side effect, I feel that my body has relaxed and healed up from 2 months of constant training. I admit that I was starting to feel sluggish when rolling; not crisp. But now I feel relaxed and ready for Wednesday's class. Sometimes it essential to take step back, whether you want to or not, to get back in the mind set of training more effectively. Because BJJ is becoming more entrenched in my life, it is alright to stand back for a moment and take a look at what it is doing for me. And with my baby girl due in less than 2 months, I will rely on BJJ more and more to a) keep me sane, and b) prepare to intimidate the hell out of future boyfriends 16 years from now with my mad BJJ skills. 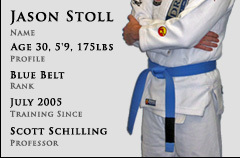 ;) I think Professor Schilling does private lessons on stare down and intimidation tactics, I will ask him tomorrow.